This is a list of English football stadiums. It is ranked in descending order of capacity. All 116 clubs in the top five levels of the English football league system in the 2017-18 season (Premier League, Football League Championship, Football League One, Football League Two and Conference National), with rankings within each league given. All stadiums with a capacity of at least 5,000, of clubs in lower levels of the national league system (level indicated in brackets). A person who has watched a match at the stadiums of all 92 Premier League and Football League clubs in England may apply to join The 92 Club. 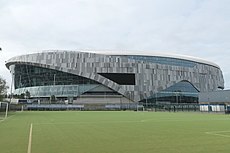 1 Wembley Stadium London 7004900000000000000♠90,000  England national football team National Stadium N/A Tottenham used Wembley for home matches during the 2017–18 and 2018-19 seasons while their new stadium was being built. 3 Tottenham Hotspur Stadium London 62,062  Tottenham Hotspur Premier League 2 From 3 April 2019 onwards. 4 Emirates Stadium London 7004602600000000000♠60,260  Arsenal Premier League 3 Also known as Ashburton Grove. 5 London Stadium London 7004570000000000000♠57,000  West Ham United Premier League 4 Previously known as the Olympic Stadium. 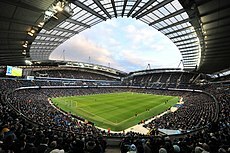 6 City of Manchester Stadium Manchester 7004550970000000000♠55,097  Manchester City Premier League 5 Commercially known as the Etihad Stadium. N/A[nb 1] Cardiff City Stadium Cardiff 7004332800000000000♠33,280  Cardiff City Premier League 10 Also home of Wales men's team. 19 Ricoh Arena Coventry 7004325000000000000♠32,500  Coventry City League One 2 Shared with Wasps of Rugby Union's Aviva Premiership. 20 King Power Stadium Leicester 7004323120000000000♠32,312  Leicester City Premier League 12 Formerly known as the Walkers Stadium. 23 Falmer Stadium Brighton 7004307500000000000♠30,750  Brighton & Hove Albion Premier League 14 Commercially known as The American Express Community Stadium (The AMEX). 27 Bet365 Stadium Stoke-on-Trent 7004300890000000000♠30,089  Stoke City Championship 10 Formerly known as the Britannia Stadium. 29 University of Bolton Stadium Bolton 7004287230000000000♠28,723  Bolton Wanderers Championship 12 Formerly known as the Reebok Stadium. 32 Ashton Gate Stadium Bristol 7004270000000000000♠27,000  Bristol City Championship 14 Expansion completed ahead of the 2016/17 season. 36 KCOM Stadium Kingston upon Hull 7004255860000000000♠25,586  Hull City Championship 16 Shared with Super League team Hull F.C. Formerly known as the KC Stadium. 37 Valley Parade Bradford 7004251360000000000♠25,136  Bradford City League One 4 Commercially known as the Northern Commercials Stadium. 38 DW Stadium Wigan 7004250230000000000♠25,023  Wigan Athletic Championship 17 Previously known as the JJB Stadium. Shared with Wigan Warriors of Rugby League's Super League. 39 Kirklees Stadium Huddersfield 7004245000000000000♠24,500  Huddersfield Town Premier League 17 Shared with Huddersfield Giants of Rugby league's Super League. Commercially known as the John Smith's Stadium, and formerly as the Alfred McAlpine Stadium and the Galpharm Stadium. 40 Madejski Stadium Reading 7004241610000000000♠24,161  Reading Championship 18 Shared with London Irish of Rugby Union's Aviva Premiership. N/A[nb 1] Liberty Stadium Swansea 7004209090000000000♠20,909  Swansea City Championship 20 Shared with Ospreys of Rugby Union's Pro14. 55 Keepmoat Stadium Doncaster 7004152310000000000♠15,231  Doncaster Rovers League One 9 Shared with Doncaster of Rugby League's Kingstone Press League 1. 56 London Road Peterborough 7004143190000000000♠14,319  Peterborough United League One 10 Commercially known as The ABAX Stadium. 57 Halton Stadium Widnes 7004133500000000000♠13,350  Liverpool Ladies Women's Super League 1 1 Shared with Widnes Vikings of Rugby league's Super League. Also known as Halton Stadium (2001–2007) and Stobart Stadium, Halton (2008–2013). Formerly known as Naughton Park (1932–1999). 67 Dean Court Bournemouth 7004114640000000000♠11,464  Bournemouth Premier League 20 Commercially known as the Vitality Stadium. 68 Bescot Stadium Walsall 7004113000000000000♠11,300  Walsall League One 15 Commercially known as the Banks's Stadium. 70 The Shay Halifax 7004105610000000000♠10,561  Halifax Town National League 3 Shared with Halifax of Rugby League's Kingstone Press Championship. N/A[nb 1] Racecourse Ground Wrexham 7004105000000000000♠10,500  Wrexham National League 4 Capacity does not include the closed Kop Terrace. 71 Proact Stadium Chesterfield 7004104000000000000♠10,400  Chesterfield National League 6 Formerly known as the B2net Stadium. 74 Spotland Rochdale 7004102490000000000♠10,249  Rochdale League One 18 Shared with Rochdale Hornets of Rugby League's Kingstone Press League 1. 76 Colchester Community Stadium Colchester 7004101050000000000♠10,105  Colchester United League Two 10 Commercially known as the Jobserve Community Stadium. 78 Field Mill Mansfield 7004100000000000000♠10,000  Mansfield Town League Two 12 Commercially known as the One Call Stadium. 81 Abbey Stadium Cambridge 7003961700000000000♠9,617  Cambridge United League Two 14 Commercially known as the R Costings Abbey Stadium. 83 Brisbane Road London 7003927100000000000♠9,271  Leyton Orient National League 5 Commercially known as the Breyer Group Stadium. 87 Bootham Crescent York 7003787200000000000♠7,872  York City National League North 2 Formerly commercially known as KitKat Crescent Stadium. 90 Recreation Ground Aldershot 7003710000000000000♠7,100  Aldershot Town National League 7 Commercially known as the EBB Stadium. 91 Whaddon Road Cheltenham 7003706600000000000♠7,066  Cheltenham Town League Two 18 Commercially known as the World of Smile Stadium. N/A[nb 1] Rodney Parade Newport 7003701200000000000♠7,012  Newport County League Two 19 Shared with Dragons of Rugby Union's Pro14 and Newport RFC of the Welsh Premier Division. 93 Broadhall Way Stevenage 7003692000000000000♠6,920  Stevenage League Two 20 Commercially known as the Lamex Stadium. 104= Victoria Road Dagenham 7003600000000000000♠6,000  Dagenham & Redbridge National League 10 Commercially known as the London Borough of Barking and Dagenham Stadium. 104= The Camrose Basingstoke 7003600000000000000♠6,000  Basingstoke Town Southern Football League Premier Division (7) 1 Commercially known as the Soccer AM Stadium. 116 Deva Stadium Chester 7003512600000000000♠5,126  Chester National League 14 Straddles the England–Wales border. ↑ "Presspack". Wembley Stadium. Retrieved 27 February 2015. 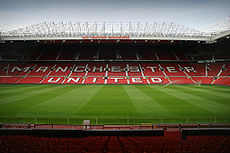 ↑ "Manchester United – Old Trafford". premierleague.com. Premier League (PL entry last updated). August 2015. Archived from the original on 20 August 2015. Retrieved 22 August 2015. ↑ White, Jim (2019-03-22). "Tottenham Hotspur's new home sets benchmark for modern stadia". The Telegraph. ISSN 0307-1235. Retrieved 2019-04-02. ↑ "Arsenal – Emirates Stadium". premierleague.com. Premier League (PL entry last updated). August 2015. Archived from the original on 22 August 2015. Retrieved 22 August 2015. ↑ "London Stadium capacity clarification | West Ham United". www.whufc.com. 8 January 2017. Archived from the original on 10 January 2017. Retrieved 12 March 2018. ↑ "Manchester City – Etihad Stadium". premierleague.com. Premier League (PL entry last updated). August 2015. Archived from the original on 7 March 2012. Retrieved 22 August 2015. ↑ "Liverpool – Anfield". 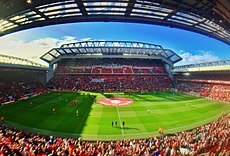 Liverpool Official Website ' 'New Anfield capacity confirmed as 54,074 . September 2016. Retrieved 9 September 2016. ↑ "Newcastle United – St. James' Park". premierleague.com. Premier League (PL entry last updated). August 2015. Retrieved 22 August 2015. ↑ "Sunderland – Stadium of Light". premierleague.com. Premier League (PL entry last updated). August 2015. Archived from the original on 8 February 2012. Retrieved 22 August 2015. ↑ "Aston Villa – Villa Park". premierleague.com. Premier League (PL entry last updated). August 2015. Archived from the original on 28 September 2014. Retrieved 22 August 2015. ↑ "Chelsea – Stamford Bridge". premierleague.com. Premier League (PL entry last updated). August 2015. Archived from the original on 21 August 2015. Retrieved 22 August 2015. ↑ 12.00 12.01 12.02 12.03 12.04 12.05 12.06 12.07 12.08 12.09 12.10 12.11 12.12 12.13 12.14 12.15 12.16 12.17 12.18 12.19 Marshall-Bailey, Tom (19 June 2015). "2015/16 Championship: A guide to each and every one of the 24 grounds next season". The Huddersfield Daily Examiner. Trinity Mirror North West. Retrieved 21 June 2015. ↑ "Everton – Goodison Park". premierleague.com. Premier League (PL entry last updated). August 2015. Archived from the original on 25 August 2015. Retrieved 22 August 2015. ↑ "Club – Leeds United". leedsunited.com. Leeds United. September 2016. Retrieved 31 October 2016. ↑ "Bramall Lane – Sheffield United". Football Ground Guide. Retrieved 27 February 2015. ↑ "Southampton – St. Mary's Stadium". premierleague.com. Premier League (PL entry last updated). August 2015. Retrieved 22 August 2015. ↑ "Ricoh Arena – Coventry City". Football Ground Guide. Retrieved 27 February 2015. ↑ "Coventry City to close Ricoh Arena stand for improved atmosphere". BBC Sport. Retrieved 26 May 2015. ↑ "Leicester City – King Power Stadium". premierleague.com. Premier League (PL entry last updated). August 2015. Retrieved 22 August 2015. ↑ "City Ground – Nottingham Forest". Football Ground Guide (FGG entry last updated). 22 June 2015. Retrieved 24 June 2015. ↑ "Stoke City – Brittania Stadium". premierleague.com. Premier League (PL entry last updated). March 2018. Retrieved 13 March 2018. ↑ "St. Andrew's (Stadium) – Birmingham City". Football Ground Guide (FGG entry last updated). 22 June 2015. Retrieved 24 June 2015. ↑ "Norwich City – Carrow Road". premierleague.com. Premier League (PL entry last updated). August 2015. Retrieved 22 August 2015. ↑ "West Bromwich Albion – The Hawthorns". premierleague.com. Premier League (PL entry last updated). August 2015. Archived from the original on 1 September 2015. Retrieved 22 August 2015. ↑ "Valley Parade – Bradford City". Football Ground Guide. Retrieved 27 February 2015. ↑ "DW Stadium – Wigan Athletic". Football Ground Guide. Archived from the original on 6 April 2015. Retrieved 27 February 2015. ↑ "Oakwell – Barnsley". Football Ground Guide. Retrieved 27 February 2015. ↑ "Watford – Vicarage Road". premierleague.com. Premier League (PL entry last updated). Retrieved 30 April 2017. ↑ "Swansea City – Liberty Stadium". premierleague.com. Premier League (PL entry last updated). August 2015. Archived from the original on 25 August 2015. Retrieved 22 August 2015. ↑ "Fratton Park – Portsmouth". Football Ground Guide. Archived from the original on 6 April 2015. Retrieved 27 February 2015. ↑ "Meadow Lane – Notts County". Football Ground Guide. Archived from the original on 7 April 2015. Retrieved 27 February 2015. ↑ "The Den – Millwall". Football Ground Guide. Archived from the original on 7 April 2015. Retrieved 27 February 2015. ↑ "Home Park – Plymouth Argyle". Football Ground Guide. Retrieved 27 February 2015. ↑ "Vale Park – Port Vale". Football Ground Guide. Retrieved 27 February 2015. ↑ "Brunton Park – Carlisle United". Football Ground Guide. Retrieved 27 February 2015. ↑ "Bloomfield Road – Blackpool". Football Tripper. 6 August 2016. Retrieved 18 November 2016. ↑ "Prenton Park – Tranmere Rovers". Football Ground Guide. Retrieved 31 January 2017. ↑ "County Ground, Swindon – Swindon Town". Football Ground Guide. Archived from the original on 2 April 2015. Retrieved 27 February 2015. ↑ "Keepmoat Stadium – Doncaster Rovers". Football Ground Guide. Retrieved 27 February 2015. ↑ "London Road Stadium – Peterborough United". Football Ground Guide. Retrieved 27 February 2015. ↑ "Widnes Vikings Ground guide – Select Security Stadium". Love Rugby League Ground Guide. Retrieved 3 June 2015. ↑ "Boundary Park – Oldham Athletic". Football Ground Guide. Retrieved 27 February 2015. ↑ "Kassam Stadium – Oxford United". Football Ground Guide. Retrieved 27 February 2015. ↑ "Roots Hall – Southend United". Football Ground Guide. Retrieved 27 February 2015. ↑ "Memorial Stadium (Bristol) – Bristol Rovers". Football Ground Guide. Retrieved 27 February 2015. ↑ "Gateshead International Stadium – Gateshead". Football Ground Guide. Retrieved 27 February 2015. ↑ "Gigg Lane – Bury". Football Ground Guide. Retrieved 27 February 2015. ↑ "Priestfield Stadium – Gillingham". Football Ground Guide. Retrieved 27 February 2015. ↑ "AFC Bournemouth – Vitality Stadium". premierleague.com. Premier League (PL entry last updated). August 2015. Archived from the original on 22 August 2015. Retrieved 22 August 2015. ↑ "Bescot Stadium – Walsall". Football Ground Guide. Retrieved 27 February 2015. ↑ "Edgeley Park – Stockport County". Football Ground Guide. Retrieved 27 February 2015. ↑ "The Shay – FC Halifax Town". Football Ground Guide. Retrieved 27 February 2015. ↑ "Racecourse Ground – Wrexham". Football Ground Guide. Retrieved 27 February 2015. ↑ "Proact Stadium – Chesterfield". Football Ground Guide. Retrieved 27 February 2015. ↑ "Kenilworth Road – Luton Town". Football Ground Guide. Retrieved 27 February 2015. ↑ "Adams Park – Wycombe Wanderers". Football Ground Guide. Retrieved 27 February 2015. ↑ "Spotland Stadium – Rochdale". Football Ground Guide. Retrieved 27 February 2015. ↑ "Sincil Bank – Lincoln City". Football Ground Guide. Retrieved 27 February 2015. ↑ "Colchester Community Stadium – Colchester United". Football Ground Guide. Retrieved 27 February 2015. ↑ "Alexandra Stadium – Crewe Alexandra". Football Ground Guide. Retrieved 27 February 2015. ↑ "Field Mill – Mansfield Town". Football Ground Guide. Retrieved 27 February 2015. ↑ "Greenhous Meadow – Shrewsbury Town". Football Ground Guide. Retrieved 27 February 2015. ↑ "Huish Park – Yeovil Town". Football Ground Guide. Retrieved 27 February 2015. ↑ "Abbey Stadium – Cambridge United". Football Ground Guide. Retrieved 27 February 2015. ↑ "Blundell Park – Grimsby Town". Football Ground Guide. Retrieved 27 February 2015. ↑ "Brisbane Road – Leyton Orient". Football Ground Guide. Retrieved 27 February 2015. ↑ "Glanford Park – Scunthorpe United". Football Ground Guide. Retrieved 27 February 2015. ↑ "Twerton Park – Bath City". Football Ground Guide. Retrieved 27 February 2015. ↑ "St James Park – Exeter City". Football Ground Guide. Retrieved 27 February 2015. ↑ "Bootham Crescent – York City". Football Ground Guide. Retrieved 27 February 2015. ↑ "Victoria Park, Hartlepool – Hartlepool United". Football Ground Guide. Retrieved 27 February 2015. ↑ "Sixfields Stadium – Northampton Town". Football Ground Guide. Retrieved 5 September 2017. ↑ "Recreation Ground (Aldershot) – Aldershot Town". Football Ground Guide. Retrieved 27 February 2015. ↑ "Whaddon Road – Cheltenham Town". Football Ground Guide. Retrieved 27 February 2015. ↑ "Rodney Parade – Newport County". Football Ground Guide. Archived from the original on 6 April 2015. Retrieved 27 February 2015. ↑ "Academy Stadium". Manchester City F.C. Retrieved 3 June 2015. This stadium will become home to MCWFC in 2015. ↑ "Broadhall Way – Stevenage". Football Ground Guide. Retrieved 27 February 2015. ↑ "Pirelli Stadium – Burton Albion". Football Ground Guide. Retrieved 27 February 2015. ↑ "York Street – Boston United". Football Ground Guide. Retrieved 27 February 2015. ↑ "Plainmoor – Torquay United". Football Ground Guide. Retrieved 27 February 2015. ↑ "Bower Field – Stalybridge Celtic". Football Ground Guide. Retrieved 27 February 2015. ↑ "Globe Arena (football stadium) – Morecambe". Football Ground Guide. Retrieved 27 February 2015. ↑ "Moss Rose – Macclesfield Town". Football Ground Guide. Retrieved 27 February 2015. ↑ "New Bucks Head – AFC Telford United". Football Ground Guide. Retrieved 27 February 2015. ↑ "Aggborough – Kidderminster Harriers". Football Ground Guide. Retrieved 27 February 2015. ↑ "Moss Lane – Altrincham". Football Ground Guide. Retrieved 27 February 2015. ↑ "Keys Park – Hednesford Town". ↑ "Haig Avenue – Southport". Football Ground Guide. Retrieved 27 February 2015. ↑ "Victoria Rad (Stadium) – Dagenham & Redbridge". Football Ground Guide. Retrieved 27 February 2015. ↑ "Kingfield Stadium – Woking". Football Ground Guide. Retrieved 27 February 2015. ↑ "Mill Farm – Kirkham". Football Ground Guide. Retrieved 1 February 2018. ↑ "The Camrose – Basingstoke Town". Football Ground Guide. Retrieved 27 February 2015. ↑ "Paddy Power Park". Football Ground Guide. Retrieved 4 June 2015. ↑ "Broadfield Stadium – Crawley Town". Football Ground Guide. Retrieved 27 February 2015. ↑ "Crabbie Athletic Ground – Dover Athletic". Football Ground Guide. Retrieved 27 February 2015. ↑ "Highbury Stadium, Fleetwood – Fleetwood Town". Football Ground Guide. Archived from the original on 2 April 2015. Retrieved 27 February 2015. ↑ "Westleigh Park". Football Ground Guide. Retrieved 4 June 2015. ↑ "The Hive Stadium – Barnet". Football Ground Guide. Retrieved 27 February 2015. ↑ "Stadium Guide". Eastleigh FC. Retrieved 26 May 2015. ↑ "The New Lawn – Forest Green Rovers". Football Ground Guide. Archived from the original on 2 April 2015. Retrieved 27 February 2015. ↑ "Deva Stadium – Chester". Football Ground Guide. Retrieved 27 February 2015. ↑ "Crown Ground – Accrington". Football Ground Guide. Retrieved 27 February 2015. ↑ "Borough Sports Ground – Sutton United". Football Ground Guide. Retrieved 27 February 2015. ↑ "Stonebridge Road – Ebbsfleet United". Football Ground Guide. Retrieved 27 February 2015. ↑ "Fortress Stadium, Bromley – Bromley". Football Ground Guide. Archived from the original on 2 April 2015. Retrieved 27 February 2015. ↑ "Kingsmeadow – AFC Wimbledon". Football Ground Guide. Retrieved 27 February 2015. ↑ "Boreham Wood FC Meadow Park". Football Ground Guide. Retrieved 26 May 2015. ↑ "Welcome to Barrow AFC!". Barrow AFC. Retrieved 17 September 2017. ↑ "Shieldfield Park – Berwick Rangers". Football Ground Guide. Retrieved 27 February 2015. ↑ "Cressing Road – Braintree Town". Football Ground Guide. Retrieved 27 February 2015. ↑ "Miadenhead United". Windsor Express. Retrieved 7 November 2017. ↑ "Solihull Moors". Football Ground Guide. Retrieved 31 May 2016. ↑ "Maidstone United". Football Ground Guide. Retrieved 31 May 2016. ↑ "Ground Info". Guiseley AFC. Retrieved 26 May 2015. ↑ "Staines Town". Football Ground Guide. Retrieved 31 May 2016. ↑ "Eppleton Colliery Football Ground". Soccerway. Retrieved 31 May 2016. ↑ "Park Hall (football ground) – The New Saints". Football Ground Guide. Retrieved 27 February 2015. ↑ 1.0 1.1 1.2 1.3 Although Cardiff, Swansea, Wrexham and Newport play in the English leagues, their stadiums are located in Wales and therefore, although included on this list, do not affect the numbers of the rankings.